I've been driving over 20 years, but never outside the US. European driving is quite different, I hear, both rule of the road and other drivers' habits. If I was to drive in Europe what should I learn and how? Is it possible to take a "European Driving" course while still in US, so that I would arrive to Europe ready to rent a car on the 1st day? By "Europe" I mean continental EU, Germany and neighbors, not the left-side-of-the-road UK. I've driven for many years in the US and also gone through the process of getting my driver's license (again!) in the Netherlands. The below is based on my experience and there are some subtle differences between countries so beware. First, to get it out of the way, almost all cars in Europe are manual transmissions, although some rental cars are automatics. In fact, if you take your driving test with an automatic, you are not allowed to drive a manual transmission until you take the exam again (after a mandatory 2 year waiting period!) with a manual transmission. The other answers touch on some common things, but the single most important difference is in right-of-way. In Europe, they rely much less on stop signs and stoplights to regulate traffic. Instead, they rely more on traffic circles, "shark's teeth" and right-of-way rules. There are some other things as well. There are two major forms of traffic circles: standard ones and "turbo" ones. Standard ones are the usual ones where one could potentially drive around them indefinitely. Turbo traffic circles may have one or two lanes for traffic entering from each side and do not permit making a full trip around the circle. Instead, one lane typically allows exiting to the right or straight across the circle, while the other permits exiting straight cross or 3/4 of the way around. Shark's teeth are just yield signs painted on the road in a "teeth" pattern. Much like there is a white line painted on the road where there is a stop sign in the US, these shark's teeth indicate you are to yield to traffic at the intersection. In the absence of other indications on right-of-way, you must yield to the person coming from the right. Yellow diamonds are used to indicate when your road has right-of-way and you do not need to do this. When there are no stop signs, yield signs or yellow diamond "right-of-way" signs at an intersection, then you must yield to the person on your right. These types of intersections are most common in residential areas. It is often difficult to know if someone is coming from the right unless you actively slow down and look carefully to your right before entering the intersection. It is important to do this though as cars coming from the right WILL expect you to yield. There are a few more subtle aspects to this. You must yield right-of-way to a bus that is leaving a bus stop within city limits, but you do not have to do this outside city limits. Also, the yellow diamonds that regulate right-of-way are posted before the intersections they govern within city limits, but outside city limits the "right-of-way" starts after the intersection (and the sign is posted after the intersection) and continues through the next intersection, at which point it ends unless the signage repeats. Right turn on red. Many countries do not allow right turn on red. Where it is allowed, such as Poland, it is governed by a special right-arrow light at a traffic light. If the right arrow light is there and green, you can turn right on red after first coming to a full stop and then yielding to any other traffic. If there is no right arrow light, right on red is not allowed. Traffic cameras. Many common traffic violations (speeding, going through red lights) are monitored by traffic cameras rather than patrol cars. 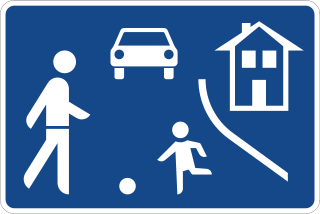 Speed limit signage. Speed limits in Europe are more complex. There are 3 areas where speeds are governed by "global limits" for that class of road: this is within built-up areas, on expressways and on motorways. If there is no explicit speedlimit in these areas, then the speedlimit is the national limit for that type of road. For example, in the Netherlands unless otherwise posted, the speed limits for a built-up areas is 50 km/h, an expressway is 100 km/h, and a motorway is 130 km/h. The key thing is unless otherwise posted. The European way is to "cancel" the previous explicit limit, which means the global limit for that class of road applies. Note also that each country has its own limits for these three classes of road, which, unhelpfully, is only posted when you first enter the country. I'm not aware of any course in the US that teaches you all this. In practice, I think the most important thing to be aware of will be yielding to those on the right in residential areas. You can comfortably practice this around your own neighborhood in the US. Learn the right of way rules. Here is the US military driving manual for Germany. It comes the major rules and if followed will work for almost everywhere in Europe. In some European countries there some things that are compulsory to carry in the car. Check for each country you're visiting what's required. Confirm what's provided by the hire co. and what you need to source. Such things as first aid kits, fire extinguishers, Hi_vis jackets (one per person or driver only), disposable breathalyzer kits, spare bulbs, warning triangles (2 in Spain), snow chains (seasonal I guess). Right-of-way rules are extremely important because everyone else drives as if you were going to respect them too, so it is easy to get into an accident by not knowing them. Other answers are covered this in great detail. It is also important to know the default speed limits for the cities and between cities you will be travelling. The most puzzling sign I found in Denmark was a red circle with a bar over a number. This indicates that the shown number is no longer the speed limit. No units are specified but this number is in km/h instead of mph as in the US. The main point though is that the sign tells you what is not the speed limit but not the new limit. Instead, you return to be within the limit for the type of road and area (city-center, residential zone, intercity road) and, indeed you must know what that is. Actual speed limit can be complicated. In Iceland, the sign is a matrix which I never managed to read entirely before passing! In one dimension, the type of vehicle is shown, in the other, the type road. The speed limit is the number, in km/h in the square which corresponds to your situation. 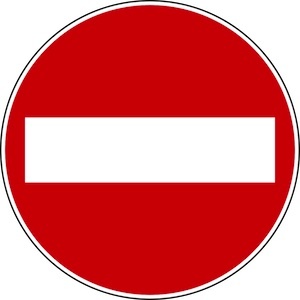 The wrong-way sign is a red circle with a white horizontal bar in it. This is seldom seen in the Americas. Parking in Europe is vastly different from North America. The rules can be complex and local to some city zones too. In one place, I think it was Akureyri (IIRC), we had to buy a paper parking meter place in the car and manually indicate the marked time on it. Other places have sidewalk colors and I've many places where people parked partially on the sidewalk (although this might not have been legal). Going with the flow ensures you be no worse than the average but that won't make it legal in Europe. In contrast, California has laws that make following the flow a legal requirement in some cases! While I visited 25 European countries, I have driven in 20 of them, relying on trains for the other 5, so I have a variety of experience driving, although based on so many less common rules, I'm sure to not have gotten everything 100% right. In the US, Canada, Ecador, Peru and Brazil, I have driven thousands of kilometres and the rules there a closer to those in Canada (Where I drove regularly for the best part of 30 years) and the US. Road safety and traffic rules differ within the EU, see an official page for this, going deeper in each country-specific one. BTW main rules are common. 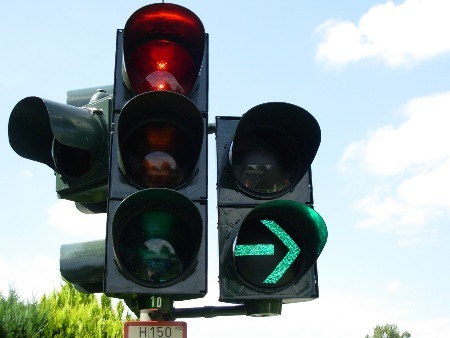 In the European Union member states in general, it is illegal to turn on a red light, unless it is indicated otherwise, for example by a green arrow on a red light (but in this case you have to allow any other one --cars as people-- to pass before you). Almost pernicious is the fact that if there is a supplementary green arrow to turn (left or, more often, only right) you can turn only when it is lighted on, even if in the main semaphore there is a full green lighted on (They are changing those one with a straight arrow instead of the full green). Keep the right as you can, do not overcome on the right (it may be allowed if the street is with three or more lines -- of course switch right with left in UK & co.). Usually a more more narrow spaces available for the cars, specially in the historical centers. Narrow streets and you can find car parked with 2-3 fingers of distance between them. (Just to understand why many people buy little cars). In some countries (if I remember well e.g. in Austria), the highways are on payment on a year base and the payment is displayed with a sticker on the front glass. Picture are taken and fine issued if not present. In other countries you pay when you exit but you need to take the ticket when you enter (It's payed on a base proportional to the km used). Remember to check for which countries the insurance is valid. The car insurance is obligatory. As already reported by Eric, "almost all cars in Europe are manual transmissions, although some rental cars are automatics" (and you have to pay more for this). This means also that they accelerate from a stop more promptly, and that they afford the curves with a different driving style (with an automatic car you need to start to decelerate before then with a manual front-wheel drive one); with sufficient high speed it can cause you at least discomfort. Remember to drive on the left side of the road in Cyprus, Ireland, Malta and the United Kingdom. It seems silly but after that you drive for a while on one of the single track road of Scotland, crossing few other people, you can easily forget it. Moreover you cross another tourist with the same amnesia! In those countries I strongly suggest you to rent an automatic car. If is best to have an International Drives License (which is basically just a translation to several languages) available from AAA. Many do not bother with this and is generally not required by car rental companies. 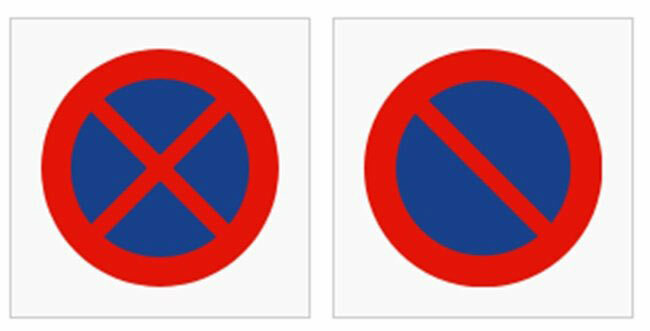 Some cities have "ZTL" (limited traffic) areas where traffic is limited to vehicle with proper stickers/registration) and the fine can be large. If there may be snow some countries (Italy is one) and it does snow you must have snow chains at least in the car. We got caught in a sudden/unexpected snow and had to buy snow chains which are often provided free for the asking when renting. Se the answer by @canonacer for more information. I've been living in Austria and driving in Europe for 15+ years now and have some experience with driving in the US. You have to get used to narrow roads, narrow parking places, narrow parking garages and almost no street parking space anywhere in cities. Not even in suburbs. Cycling is a thing in Europe and not all cyclists follow rules. Motor cycles are also common and their riders do sometimes also not follow the rules. But the most important thing you have to learn is the odd road signs you will encounter. Almost no texts, which may come in handy as if you don't speak multiple languages, but lots of pictograms which slightly differ from country to country. A friendly place, isn't it? So, could anything bad happen here? Yes, because this sign indicates a living street and speed is restricted to 5 km/h. Parking is also restricted, and you have to yield to traffic when you leave it again. Failure to do any of this will lead to a fine or even worse, an accident. Not the answer you're looking for? Browse other questions tagged europe driving driving-licenses or ask your own question.